Space Marine Steam Key in stock NOW! Preload now only 24 euros! Space Marine CD Keys are in stock NOW. That means you can collect your code immediately after payment and activate the key immediately and pre-load the game! The space marine steam key you receive is a fully region free activation code for space marine which you can activate on Steam. Immediately after you activate on steam you can begin pre-loading the game. 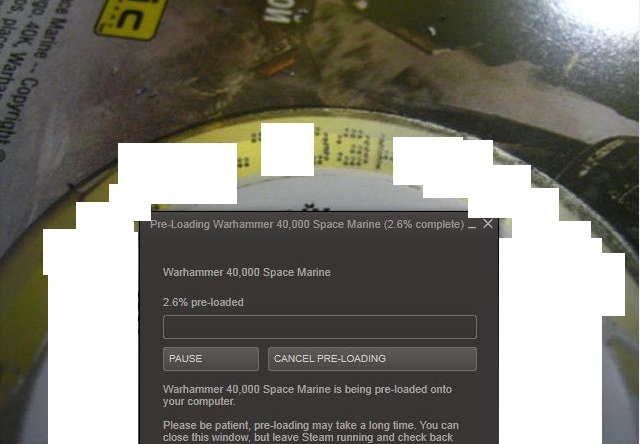 The space marine preload is active right now. Space marine does not have a region lock. This means that the space marine DRM allows activation anywhere in the world. You can activate this game, pre-load it, and then the game will unlock on the moment of game release. Immediately after your payment you can collect your legal space marine activation code from our AutoKey system. This is an automatic delivery system which will present you with your unique space marine product key. You can enter the space marine product code into steam which will grant you to a full space marine digital download. All space marine serials that we sell are unused and taken directly from sealed and brand new retail boxes. Because space marine is a steamworks game, any warhammer 40k space marine cd key will work on steam. CJS CD Keys take advantage of this by selling the activation codes for this game at discounted rates. We can make extremely competitive prices thanks to the savings that we make on postage. We can pass these savings directly to you. Best of all, it’s good for the environment!